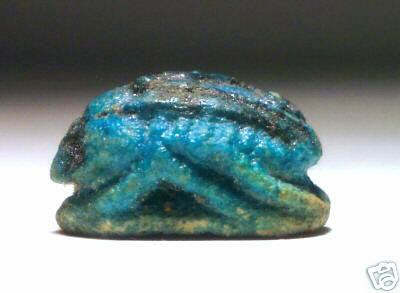 Offered on eBay by seller "N"
On display is an attractive New Kingdom scarab typical of the Amarna Period. The top surface is superbly glazed with the image of the symbolic Eye of Horus. The base is inscribed with an interesting illustration Composed of faience and displaying an outer deep blue glaze with varoius detail highlighted in a black glaze. Pierced through for suspension. 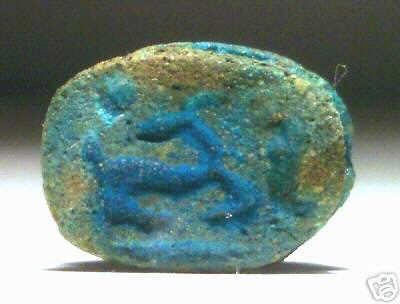 Ancient Egyptian Amulet. 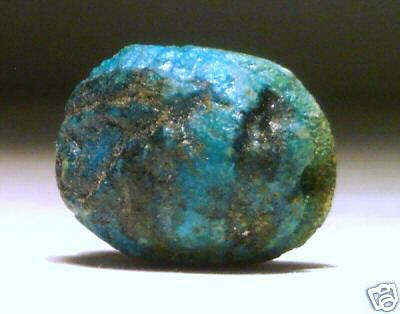 New Kingdom (Amarna Period). 1550 BC - 1350 BC. 18mm x 13mm.